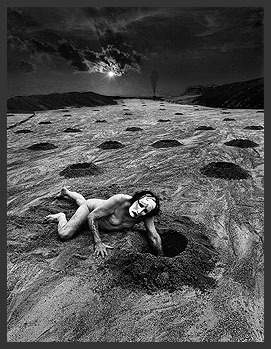 There is a beautiful simplicity to the design of Misha Gordin’s website and the web address itself offers sound advice “bsimple”. 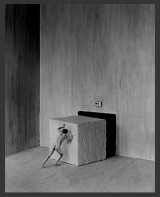 My first encounter with Misha Gordin’s work came shortly after the launch of his website in 1998. I remember being completely taken with his imagery and nearly fell out of my chair when I learned that his dark, beautiful, dreamscapes were not digitally manipulated in any fashion. My first time through his online gallery I recall carefully looking at every single image, many times over. I was completely taken in, feeling enchanted, ignited, enthralled and engaged. I wanted to climb into these exquisite little universes he created and experience them. To have a way to explore, wander around and see what it felt like to live within these snapshots of a dream. I wanted to speak with the subjects in his images . . . the creatures. I wanted to know what their story was, I wanted to learn all about them. His pictures have a hushed kind of reverence about them, an intriguing kind of calm. His images quiet my mind, allowing me to surrender into my imagination. It’s easy and irresistible to immerse myself in his work and just become wonderfully lost for awhile. His images leave me feeling like he has captured something, that’s how real they are for me. Misha Gordin makes sense of things that shouldn’t make sense. I have viewed the kind of imagery where an artist creates magnificent altered realities. BUT that is how I experience them, as altered realties – my mind is thinking, processing, deciphering, breaking everything down. I know it isn’t real. Are the forces at battle? Good and Evil? I found myself particularly drawn to his Shadows series. The humanity offered up so gracefully in this series compels and moves me – I feel connected. The subjects he photographs are uniquely beautiful, fragile yet strong creatures that seem to exude a muted kind of melancholy. As well as a strange kind of isolation and desolation . . . yet not lacking in spirituality – a fascinating kind of dynamic. 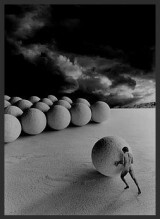 One of my favorite images is “Inspiration”. In my world, I experience this image as two bald women at the shore of the sea, one of the creatures is dressed in a simple black dress, conducting Mother Nature in a commanding way as if she was beckoning the dark angry clouds, looming overhead. . . in contrast to the other creature, of whom, was dressed in a delicate white dress, sitting with her harp, tuning into her own internal melody. Are the forces at battle? Good and Evil? Darkness and Light? Duplicity? In my world . . . perhaps. With his “Remember” he poetically unravels the mysteries of his childhood experience. The way he describes growing up inside these experiences is much like a master story teller. He has a magnetic way with words and when I came to the conclusion of these 27 lines I found myself not wanting the journey to end. “Remember” helped me to understand the why and what of his imagery. Yet with the imagery itself, he leaves it open-ended, allowing me the opportunity to live in these images as I am. I am not told how to interpret, or if to interpret. I am not told how to think or feel. I am able to connect to these images in my own, personal way. With imagery and words this intuitive visionary makes the unimaginable …imaginable, the unbelievable …believable and the impossible …possible.